The main on-site impact of soil erosion is the reduction in soil quality which results from the loss of the nutrient-rich upper layers of the soil, and the reduced water-holding capacity of many eroded soils. In affluent areas of the world, accelerated water erosions on-site effects upon agricultural soils can be mitigated by increased use of artificial fertilizers; however this is not an option for much of the earths population. 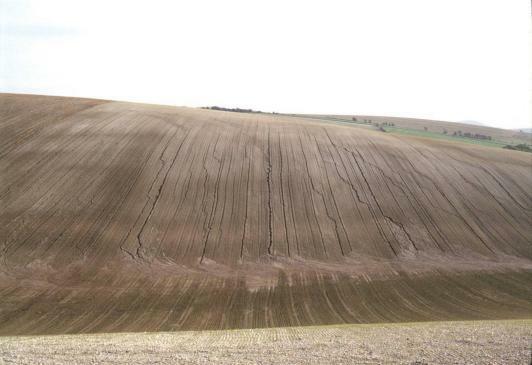 Erosions removal of the upper horizons of the soil results in a reduction in soil quality i.e. a diminution of the soils suitability for agriculture or other vegetation. This is because the eroded upper horizons tend to be the most nutrient-rich. Also, because the finest constituents of eroded soil tends to be transported furthest, eroded soils become preferentially depleted of their finer fraction over time; this often reduces their water-holding capacity. In other words, Erosion removes the cream of the soil. Increased use of artificial fertilizers may to an extent, and for a time, compensate for erosion-induced loss of soil quality where economic circumstances are favorable. This is not usually feasible in developing countries however. Loss of soil quality is a long-term problem; globally, soil erosion's most serious impact may well be its threat to the long-term sustainability of agricultural productivity, which results from the the on-site damage which it causes. Crops are particularly reliant on the upper horizons of the soil, which are the most vulnerable to erosion by water and wind. In this sense, erosion removes 'the cream of the soil'. Agricultural tillage also redistributes soil, resulting in thinner soils on topographically convex areas within a field. The damaging on-site effects of erosion, in terms of decreased agricultural yields, are well known in the developing countries of Africa and Asia. But even in the developed world there is cause for concern. Water erosion is locally severe in Australia, New Zealand, parts of the US, Southern Europe, and Eastern Europe (often as a result of the former large state-controlled farms). In erosion-prone areas of the more affluent countries of the world, productivity may be maintained in the short to medium term by increased fertiliser input. The effects of erosion are thus rarely acknowledged by farmers in richer countries. This strategy is however infeasible with regard to erosion in developing countries.